What is Advanced PC Care? 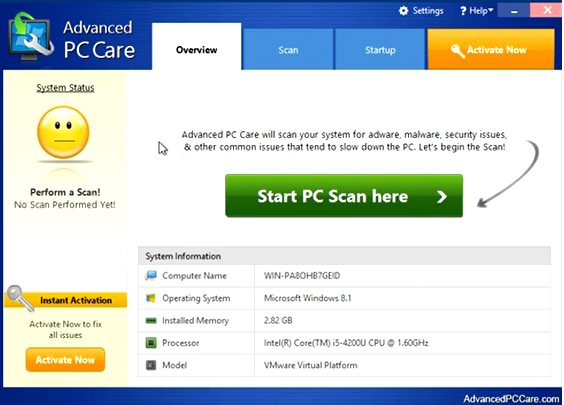 Advanced PC Care is an application that promises to find the malicious software installed on the computer and remove it. Also, it says that it will fix a number of problems in order to boost the computer’s speed, for example, it is stated that it can solve system performance issues, system/user software issues, and startup/uninstall issues. Even though the application seems to be very beneficial, users who install it on their computers often get disappointed with it and we know why. Continue reading this article to get more information about Advanced PC Care. If it happens that you decide to remove Advanced PC Care after reading this text, we are sure that you will find answers to all your questions regarding the Advanced PC Care removal in the last paragraph. What does Advanced PC Care do? Advanced PC Care will begin a system scan after the installation, and it will display the scan results after several minutes. Therefore, it is not surprising that many people think that it is a powerful PC optimization tool. Specialists do not say that Advanced PC Care is a dangerous threat that has to be eliminated right now; however, they do not think that this program can be fully trusted either. First of all, it has been found that this program always shows many errors, so it is very likely that it detects good files stored on the computer as threats and, as a result, its scan results cannot be fully trusted. In addition, it seems that Advanced PC Care is not going to do anything useful, i.e. to fix errors it finds unless a user purchases the license. It costs $39.99, which is not a very large sum of money; however, specialists suggest investing in a more reliable tool instead of buying the license of Advanced PC Care. As this PC optimizer will be useless if you do not upgrade it, you should uninstall Advanced PC Care from your computer as well. This will not allow it to work in the background on your computer. How did Advanced PC Care enter my PC? If you are sure that you have not downloaded Advanced PC Care yourself, it is very likely that it has sneaked onto your system illegally. In most cases, potentially unwanted programs travel in software bundles with free applications and users install them accidentally. Always go for the custom installation of software if you wish to prevent additional software from being installed on your PC. In addition, it would be smart to have a reputable security application installed on the computer as well. How can I delete Advanced PC Care? Advanced PC Care is a potentially unwanted program, so, as in the case of other similar applications, it should be possible to remove Advanced PC Care via Control Panel. If you still do not know how to delete Advanced PC Care manually, let an automatic antimalware tool to perform the Advanced PC Care removal for you. Of course, you will have to acquire and install it first on your PC and then start the scanner.